THE TERENCE DORRITY COLLECTION: The period 1961 to 1965 was arguably the last glory days of steam traction before its sad demise. 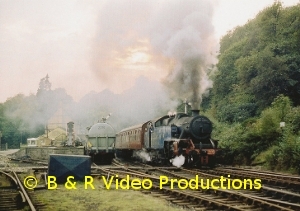 Terence Dorrity took the opportunity to film steam during this period, on all regions of British Railways, the Welsh Narrow Gauge railways and on the Continent. Our journey begins with 4-6-0 “King George V” arriving at Birmingham Snow Hill contrasting starkly to the lines of stored Kings at Wolverhampton Stafford Road Shed. At Stratford-on-Avon there is much activity including freight trains and Castle hauled expresses to the West Country, plus trains to Evesham and Leamington Spa. There are visits to Banbury, for more freight trains & Kings on Birmingham expresses, Hereford Shed, Gloucester Shed and Cardiff station. Then to Tuffley Junction, Gloucester, for a variety of trains, to Chalford (including an auto train footplate ride) and Moreton-in-Marsh. We visit the Cardigan branch, Morfa Mawddach, Oswestry, Welshpool and Talerdigg summit (with Manors and Standard 4s) before returning to Hatton Bank on the London to Birmingham line for 2-8-0 4707, Castle & King hauled trains & Bulleid Pacifics on football specials. Onwards to the Southern Region for scenes at Templecombe, Eastleigh Shed & Worgret Junction with M7 tanks on both the Swanage push-pull trains and the Lymington Pier line. There are Terrier 0-6-0Ts on the Hayling Island branch and O2 tanks on the Isle of Wight! Next, to Rugby on the Midland Region in 1962, for Princess Coronations, Britannias, Patriots, Scots & Jubilees. A trip to Scotland features the ex-Caley Single on tours and A4s on the Aberdeen 3 hour expresses. Then to the Eastern Region and at Kings Cross we see A1s and A4s (including 60008 “Dwight D Eisenhower”) and A2s and A3s at Wood Green.. 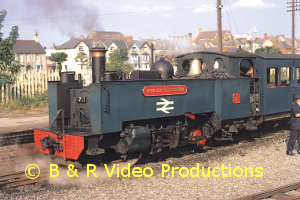 Early preservation scenes feature the Bluebell (1963), the Isle-of-Man Railway (1963), Vale of Rheidol (1965), Welshpool & Llanfair (1965), Tal-y-llyn Railway (1962), Ffestiniog (1965) and Snowdon (1962). We see industrial steam in 1962 at Kettering Furnaces, Wellingborough, Bilston (Wolverhampton), Beckton (North London), Oxford Ironstone (Banbury, Roxton), Waterside (Ayrshire, 1965) and Coventry Colliery with ex-GWR 15xx 0-6-0PTs (1969). Finally, to Granada in Spain (1961) to see 240 No.2020 and many other types on the shed there, some being over 100 years old. Then to Nice in France (1962) to see the 141 Class and a variety of steam locos in the station and the shed, narrow gauge on the Reseau Breton in Britanny (1964) and French main line steam at Nantilles. We end our journey with steam into the sunset at Coventry Colliery. An interesting record of Dr.Rogers’ search for the more unusual views and of his early passion for the smaller gauges of steam railways, that of narrow gauge and miniature systems, before he recorded the ending of standard gauge railways on the national network. This journey took him as far away as India for their narrow gauge, rack railways and steam up to Broad gauge. He also visited Ireland for the County Donegal and the Tralee and Dingle. From garden railways through to all gauges up to 15″ on passenger carrying miniature systems, some of considerable length, others around parks and now lost on the sands of time like Christchurch and Audley End. Narrow gauges in Wales include the Welshpool and Llanfair when it ran through the streets, the beginnings of the Ffestiniog and Tal-y-Llyn and the Vale of Rheidol in its early days. There is industrial narrow gauge at Bowaters in Kent. Ireland’s Tralee and Dingle, County Donegal and Fintona horse tram, Katwijk in Holland. Tournon in France and India with the Darjeeling and Nilgiri rack railway are among others seen in the sub continent. The film begins and ends with British standard gauge scenes that caught the attraction of Dr. Rogers as it reached its demise in the 1960′s. Some fascinating and rare views in this film. Filmed in colour and black and white from 1949 to 1967. A detailed commentary and authentic sound track completes a nostalgic record of steam with something different to offer. 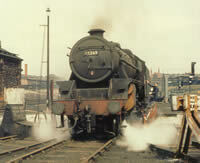 The second volume will deal with his coverage of British main line steam. The second video in the series offers a further multitude of fascinating subjects in nine sections. We begin with a look at the 9Fs on British Railways (including the ex-Crosti type) and 92203 and 92220 on railtours in the 70′s. Others are seen around Warrington and the Lune Gorge. The Marlow Donkey was famous in Great Western history and was re-lived in 1973 using 1450, 6106 and 6998 on the branch from Maidenhead to Marlow via Bourne End. When main line steam on BR came to an end in 1968, many farewell specials were run and we next include two of them, the Lancastrian No.2 Railtour and an SLS tour from Stockport to Carnforth using Britannia 70013 and Black Fives 45156 and 44949. Narrow gauge working is depicted by scenes on the Bowaters Paper Mills in Kent before closure. The scenes contrast the locomotives working days with the pleasure they now give to passengers at Whipsnade. There is a tribute to steam power out of Waterloo in 1967. Featured are the Bournemouth Belle, an immaculate 34057 (as only Salisbury shed could do), 75069 (now preserved on the SVR), Bullied Pacifics, Standard 5s, 80xxx and 82xxx tanks. The steam shed visited on the volume is Stockport Edgeley showing Stanier Class 5′s and 8F’s in their natural environment, the motive power depot and the men who worked on them while they were turned and coaled. The continental section shows Pacific power with action from France and Germany which lasted some years after the end of steam in the UK. Both preserved continental pacifics at Carnforth are seen in action in 1976 and the French Pacific at the head of the Golden Arrow leaving Calais Maritime. Hof, Trier, Crailsheim, Lathen and Berlin feature 01 and 03 classes at work. WD 2-10-0 “Gordon” is shown over the last 25-years from its rare appearance on the Southern Region in 1966 through its days at Longmoor to its visit to Shildon and preservation on the Severn Valley Railway. We conclude with industrial steam at Shilbottle Colliery in Northumberland where 0-6-0 tanks worked hard on the three mile branch of the NCB in 1969. Again another good mix of steam traction in full variety from the humble colliery tank to the great expresses of yesteryear.